I first met Amy Sue Nathan in an online memoir workshop in 2007. Nathan was trying to write down the bones of recent and tragic events. In 2002, with two young children, Nathan’s marriage broke up. Just two years later, her ex-husband died unexpectedly, by then having fathered a third child with his second wife. Nathan soon discovered that her story was too sensitive and personal to publish as a memoir. 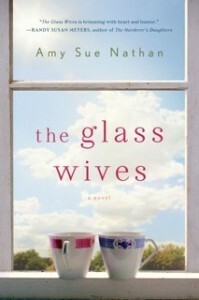 Slowly, like sediment forming a fossil, she replaced details of her real-life story with fictional details, yet kept the basic imprint: Both Nathan and her fictional character The Glass Wives share a driving concern, guiding twice-traumatized children through life-shattering events. The novel explores how Evie and, indirectly, Nathan, came to befriend the second wife, how they learned to stick together for the sake of the children. “The best way to heal the gaping wound in Sam’s and Sophie’s hearts was to keep Nicole and Luca in their lives,” Evie says, but quickly adds that “a woman had to have boundaries.” Indeed, Evie’s boundaries are tested repeatedly throughout the novel. During the four month period in which Evie tries to take her children from “a volcano of grief” into something approximating normal, she faces the judgment, platitudes, speculations, and morbid curiosity of friends and neighbors. When Evie learns of Nicole’s tragic past, however, she realizes that she too has judged harshly. It’s all about story telling. I like to write and to read about characters and how they react to what happens to them, which is the plot. I want more character when I read a plot-driven novel. Yet, if I read a novel with little plot, I get bored. When I write, I am conscious of plot points and to make sure they don’t get lost within the folds of the characters.